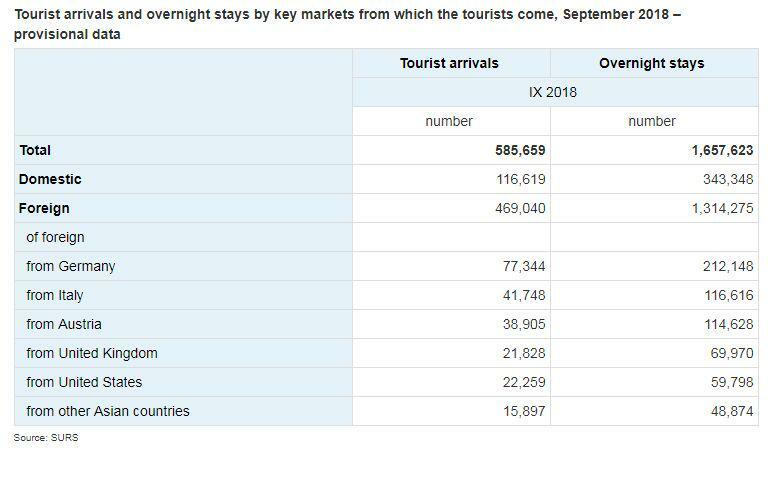 Almost 586,000 tourist arrivals and almost 1.7 million tourist overnight stays were recorded in September 2018. Foreign tourists generated almost 80% of all tourist overnight stays, of which the most (16%) tourists from Germany. Almost 586,000 tourist arrivals and almost 1.7 million tourist overnight stays were recorded in Slovenia in September 2018. Domestic tourists generated almost 117,000 arrivals and more than 343,000 overnight stays. 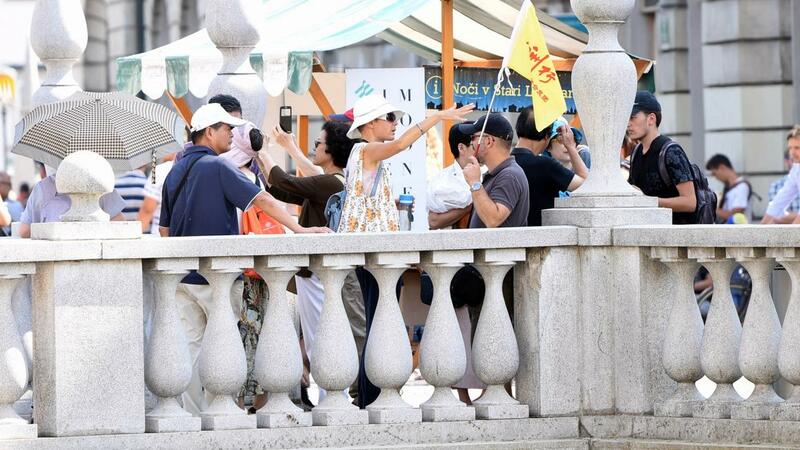 Foreign tourists generated more than 469,000 arrivals and more than 1.3 million overnight stays. Foreign tourists generated almost 80% of all overnight stays in September. Key markets, from which the most foreign tourists who generated the most overnight stays in Slovenia came, were Germany (16% or more than 212,000), Italy (9%), Austria (9%), the United Kingdom (5%), the United States (5%) and other Asian countries (4%). More than 900,000 or 55% of all overnight stays were made in hotels, 13% in apartments and holiday villages, 11% in campsites, 5% in private accommodations – rented rooms, dwellings, and 4% in youth hostels. 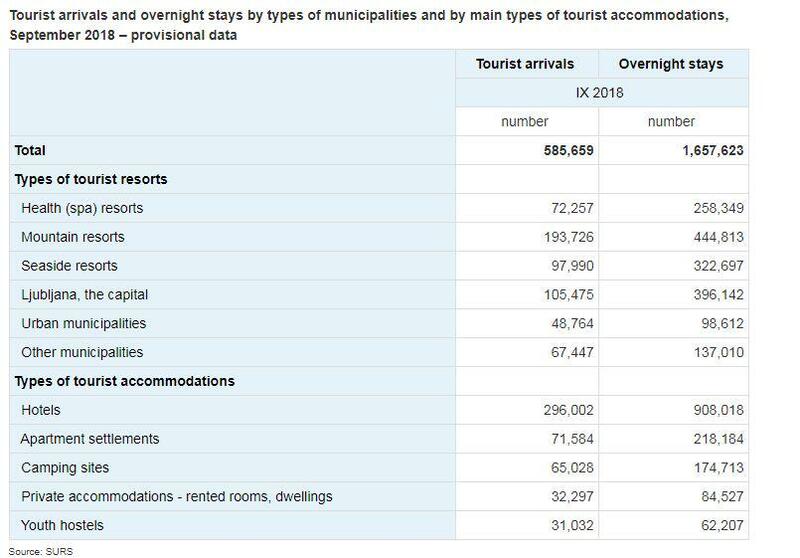 The highest number of tourist overnight stays in September 2018 (27% or almost 445,000) was recorded in mountain resorts, followed by municipality Ljubljana (24%), seaside resorts (19%) and health (spa) resorts (16%).